A sensationally tasty lime-marinated salmon dish which is perfect to serve as part of a buffet, or as a meal served with an avocado and tomato mixed salad. You can serve it warm or cold. I have served this salmon - together with other dishes - on numerous buffets that I’ve made for different clients and there has a never been a scrap of salmon left, no matter how much I’ve made. The mango chutney sauce that accompanies the salmon is a complete taste-sensation! Totally and utterly gorgeous! 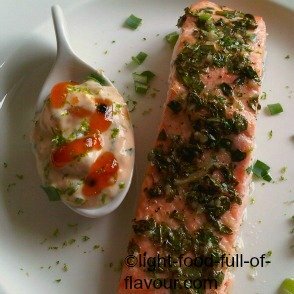 As well as serving this lime-marinated salmon with a mixed salad, I often serve the salmon with a warm lemon and garlic infused potato salad (see recipe below). You don’t hear me mentioning potatoes often. This is not because I don’t like them – Swedish people in general are crazy about potatoes - but because I believe it’s better to swap potatoes for more nutritious root vegetables. And let’s face it - it’s not a good idea to indulge in things like potato salad if you are watching your weight. My potato salad is a light-weight version though, with very little fat added. With a meal like this it is portion control that matters if you are watching your weight – less of the divine sauce and potato salad and more of the salmon and fresh salad. Tip: To get more juice out a lime, press down on the lime with you hand and roll it back and forth on a chopping board for about a minute before cutting it in half. 1. Preheat the oven to 200C/fan 180C/400F/gas mark 6. Put the salmon - skin side down - in an oven-proof dish lined with baking parchment. Mix the ingredients for the marinade and brush it over the salmon. Leave to marinate at room temperature for 20 minutes. 2. Make the mango chutney sauce (see below) while the salmon is marinating. 3. Place the lime-marinated salmon in the oven and roast uncovered for about 18 minutes, a few minutes less if the salmon is quite thin. Check with a knife to see if the salmon is ready – it should still be slightly translucent in the middle. Simply mix all the ingredients for the sauce and leave to the side. 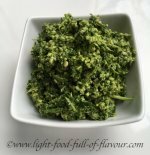 Mix the chopped parsley, lemon zest, crushed garlic, light crème fraîche and some salt and pepper in a medium-sized bowl. Boil the potatoes and once cooked and drained, toss them in this mix while still warm.